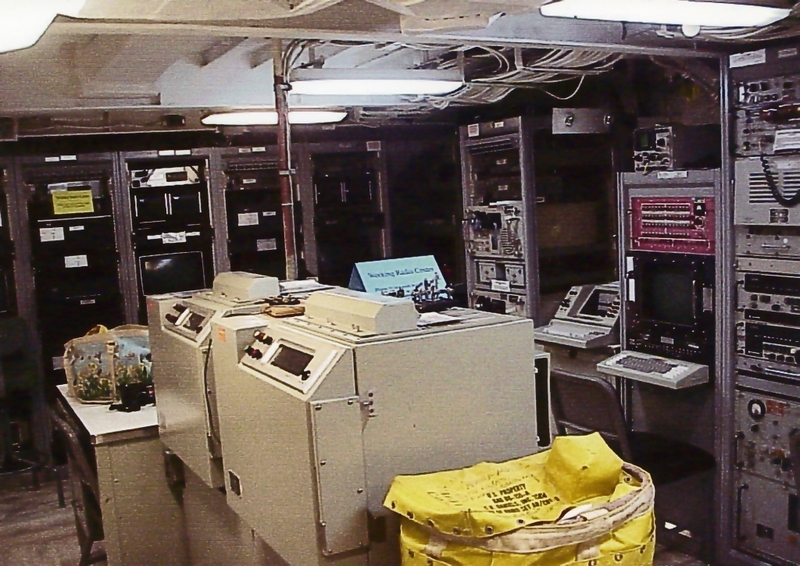 A group of hams volunteer to rescue vintage radio gear from mothballed Navy ships. Planning was everything. Timing was especially crucial and arrival at the “jump off” point would have to be precise or there would be no one to guide our raiding party. Those selected for the mission would have to be in shape to withstand the rigors of the raid, which was to involve climbing countless ladders and stairs and walking seemingly endless miles while searching through dark compartments for the items of our quest. Our mission was to locate and procure supplies and equipment for the USS Missouri, a floating museum and tribute to all those that lost their lives on December 7, 1941 and to all those who served in WWII. 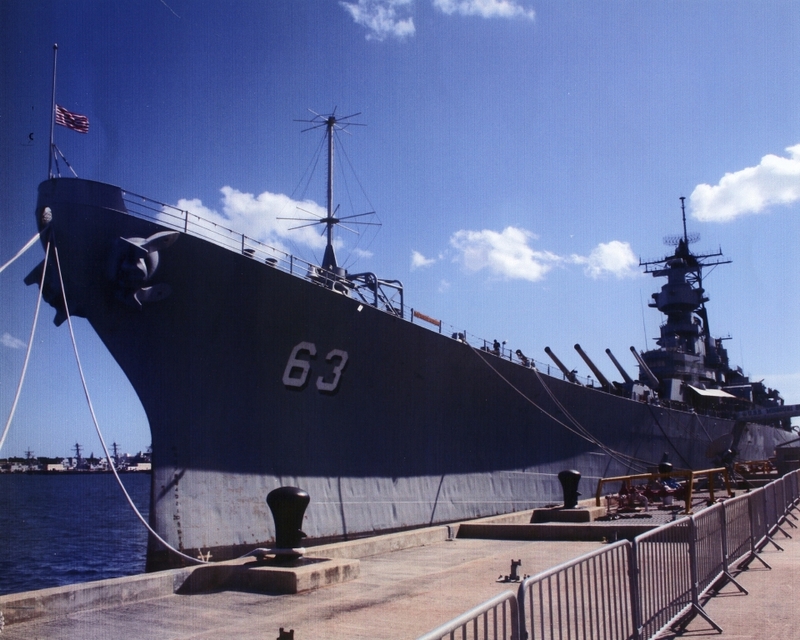 The USS Missouri, BB-63, was the world’s last and most famous battleship. It was on her deck on September 2, 1945 that the Japanese formally surrendered ending WWII. 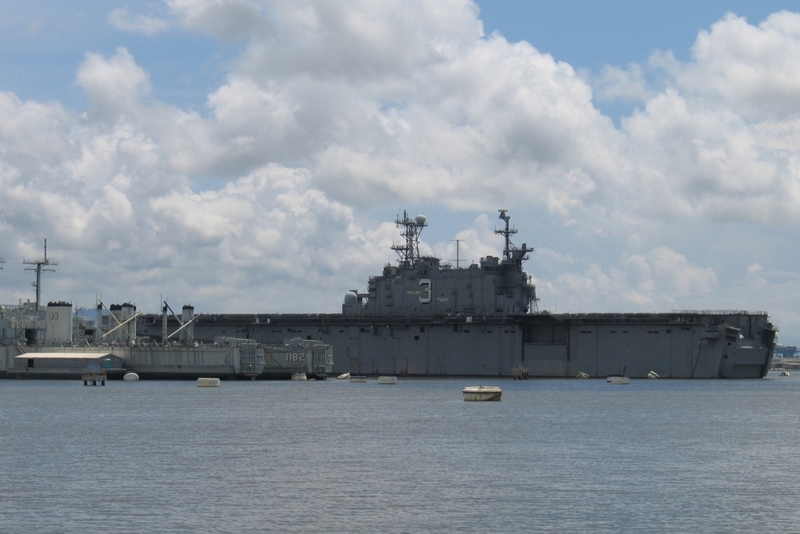 She is moored on Pearl Harbor’s historic Battleship Row. December 7 is commonly referred to and thought of as the date of the Japanese raid on Pearl Harbor. In actuality, many other bases were attacked prior to that event. Kaneohe, Wheeler Army Airfield, Fort Shafter, Schofield Barracks and others were attacked before the raiding aircraft arrived at Pearl Harbor. A group of USS Missouri volunteers, including Ned Conklin, KH7JJ; Chuck Epperson, AH6SC; Sue Meckley, W7KFI, and Pete Wokoun, KH6GRT, met at the mothball fleet’s shipyard entrance at 0730. The Mothball Fleet is a collection of decommissioned ships that are awaiting disposal in the Naval Inactive Ship Maintenance Facility at Pearl Harbor. We teamed up with “Rod” Rodriguez, our guide for the raid, and armed ourselves with hard hats and flashlights. Our mission involved three targets, a Marine assault ship with an aircraft landing deck, a research ship and a supply ship. To reach our targets we had to slosh about in a landing craft containing about 8 inches of water that had accumulated after one of Hawaii’s infamous downpours. Hours were spent going up and down ladders and stairs, around and through the multitude of compartments on board these ships. 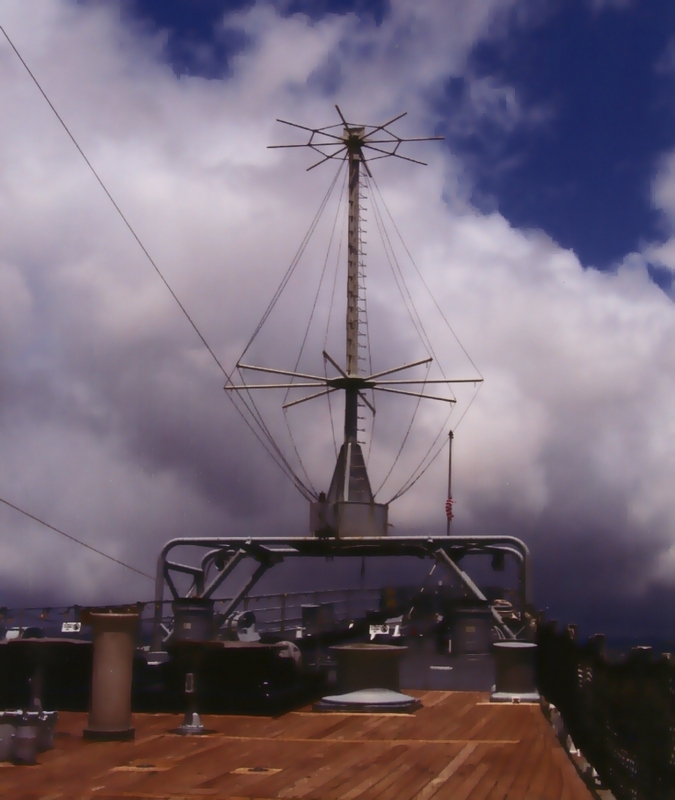 We were looking not only for specific pieces of electronic gear for Radio Central on the USS Missouri, but also items that could be used or displayed almost anywhere on board the battleship museum. Lots of items were indicated for removal, including but not limited to phones, signs, binocular storage cabinets, cables, porthole hardware, magnetic compasses, repeaters, instruments, antenna tuners. It was amazing to see just how much gear had been stripped from the ships. I was struck by the thought of how much equipment — not to mention money — it took to outfit one ship for sea. Seen from the outside these ships look plenty big, but get inside one and roam around, and you begin to realize what a monumental task it must be to prepare them for duty with the US Navy. It certainly felt spooky wandering through the ships with no one aboard besides our raiding party, the compartments almost bare and only a few lights dimly illuminating the interiors. I was surprised by the amount of rainwater on the decks of several compartments, apparently left there from the torrential Hawaiian downpours that have penetrated the empty hull feed-throughs. To keep from losing anyone, we all kept within a compartment of each other. No roaming on one’s own was allowed. Everything was fair game. If we could, we removed items on the spot. If an item was hardwired in place or mounted securely, we noted the ship, compartment number and item, and tagged it for later removal by shipyard personnel. Well, that’s the story of the great “Mothball Fleet Raid.” Sadly (grin) I won’t be in Hawaii for next year’s raid. Instead I will be somewhere in the South Pacific continuing my multiyear solo DXpedition to several rare and beautiful South Seas islands such as V7, T32, V73, etc. Listen for me; perhaps you can put me (and my South Seas DX location) in your log. Still, the raid was an experience to be treasured. I enjoyed it immensely and gained a new appreciation of and respect for the US Navy. Sadly, the Marine assault ship is scheduled to be used as a target ship and sunk by the US Navy. Apparently maintaining such ships in the Mothball Fleet is too expensive. And the Navy will gain quite a bit of valuable “weapons effectiveness” experience and knowledge from its sinking. If you are ever in Honolulu, by all means visit the USS Missouri. Contact KH6BB in advance and arrangements can be made for you to operate from Radio Central. Operating from KH6BB is quite an experience. Plus you’ll gain an appreciation of the propagation problems we have here in Hawaii, which is the most remote inhabited island in the world. After all, a kW with a 30 foot tall discone antenna and a ground consisting of the USS Missouri and the Pacific Ocean can’t be all that bad. All photos by Susan Meckley, W7KFI. Susan Meckley, W7KFI, is on a multiyear solo DXpedition to the South Pacific Islands. She and her good ship USSV Dharma (a Challenger 32 sailboat) will be visiting many rare and beautiful islands and putting them on the air. Susan is a retired US Army Master Sergeant with 32 years of service. This DXpedition is the culmination of a plan she has had for 35 years to retire from the military and take off into the far Pacific on a small sailboat. Back in the early 1950s she read about the yacht YASMI and Danny Weil’s DXpeditions and vowed to do one herself someday. Her DXpedition is entirely self funded. While sailing the South Seas, Susan can be reached at w7kfi@arrl.net or ussvdharma@yahoo.com.